The other day, my husband and I had lunch with another couple at a salad bar restaurant. We ate and talked, talked and ate. Before we knew it, we had been there for more than five hours…it’s a wonder that we didn’t get kicked out of the place! Not only did we do some serious visiting with our friends, but we put a nice dent in the salad bar over that five hour period. Perusing the plethora of yummy salad fixings can be quite thrilling! The best part of eating at a salad bar is experiencing the freedom of picking and choosing what you want to put on your salad…if you’re like me, you can say “yes, yes, yes!” to the spinach, cheese, tomatoes and olives with ranch dressing. At the same time, you can say “no, no, no!” to the beets, onions and radishes, because in your world, they don’t even exist as an option. 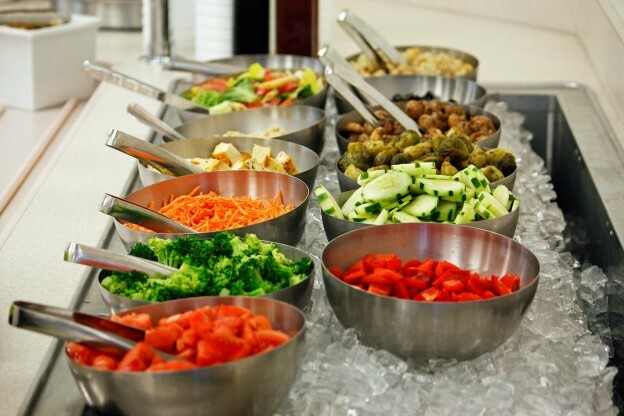 Unfortunately, Christians often approach the gospel of Christ much like this salad bar. Just like their favorite salad fixings, Christians have become quite good at selecting our “favorite” sins, while simply skipping over and ignoring other sins that we prefer not to focus on. Romans 1:29-31 lists what I think is the longest inventory of sins given in the Bible. Before receiving the revelation of grace, this list used to make me feel both proud and condemned, all at the same time. Proud, because I was able to look at some of those sins and say, “I would NEVER commit a sin like that one!” Condemned, because a couple of others on the list pointed straight into my soul, saying, “Yep, you know you’ve been guilty of THAT one!” Not being able to reconcile how I could still be considered saved when verse 32 clearly states, “…those who practice such things are deserving of death,…”. I had no choice. I was forced to skip over those sins that pertained to me. I simply had to pretend that they didn’t exist. But ignoring them didn’t change the truth – that my life sometimes is reflected in that long list of sins. And because of that, guilt and condemnation ruled in my life, attempting to keep me separated from God and His love for me. If we think we can impress God because we don’t commit certain sins (while still committing others), then we are fooling ourselves. Wow, that is tough! So, what are we to do? Grace is our only answer! The gospel of Jesus Christ is about the grace that each of us has been given. Because of Jesus’ sacrifice on the cross, we can freely receive forgiveness, favor, and blessing from God – even though we haven’t deserved it! Sounds almost too good to be true? Well, that is actually the true definition of the gospel: The over-the-top, too-good-to-be-true Good News of Jesus! So, let’s stop approaching the gospel like the salad bar. Let’s stop picking and choosing which sins to focus on. Let’s stop judging others for their sins. Instead, let’s begin to share the Good News that through God’s grace, we have been given the power to overcome sin, guilt and condemnation. By focusing on His grace instead of our sins, we WILL become transformed into the likeness of Jesus! This entry was posted in Coaching on September 13, 2015 by kHHz9uqIE4UG.